This posting is the first of a three-part series I plan to write about the modes of salvation. According to Dictionary.com, “mode” is defined as: “a manner of acting or doing; method; way…” There are two ways or methods of salvation that I will be discussing and they are choice and election. By choice, I’m referring to salvation as a result of an act of the will on the part of an individual to accept the Gospel; and by election I’m referring to salvation as a result of God’s choosing. Or, to put it another way, choice is by man’s initiative and election is by God’s initiative. This is not to say that I’m proposing a new paradigm for becoming saved. Salvation can only be attained by “grace through faith”1 as it was, is now, and always will be. The debate is about how one acquires the faith that is necessary for becoming saved. Does one acquire this faith as a result of a willful decision to accept Jesus or is it a “gift of God” as stated in the latter part of Ephesians chapter 3, verse 8? I believe it can’t be both, so I intend to argue that it is the latter. The way of salvation can be understood as the process of man being transitioned from the natural or unsaved state, which exists at birth, to the spiritual or saved state. In the natural state, man is under the judgment of God and is considered unregenerate or unsaved. In the spiritual state, man is born again, and is saved. As I’ve said in a previous posting, man needs to be saved from spiritual death that was brought on by Adam when he transgressed in the Garden of Eden.2 The only way for man to transition from the natural state to the spiritual state is through saving faith as illustrated in Figure 1. 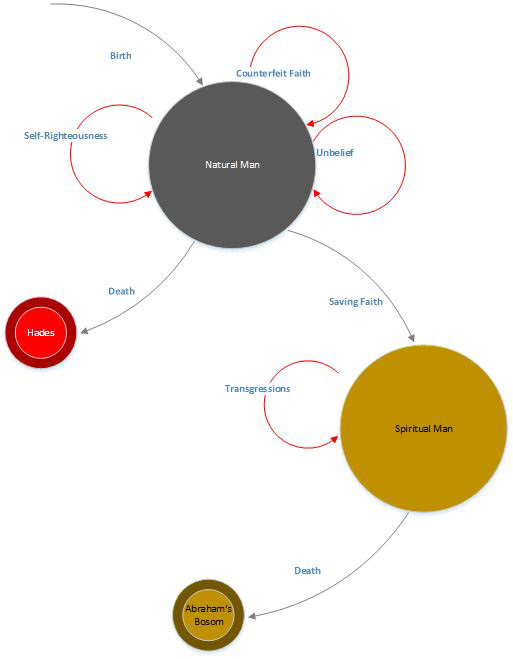 As illustrated in Figure 1, there are a number of events, represented by red-lined arrows, which will not cause a person to transition to the Spiritual Man state. I’ve included three events which I consider to be all encompassing: Self-Righteousness, Counterfeit Faith, and Unbelief. Note that these three events cause the person to remain in the Natural Man state. Unbelief is probably the easiest to understand as it includes atheists, people who don’t believe in deity; agnostics, people who believe that it is not possible to know whether deity exists or not by using the scientific method; and apostates. Apostates are those who have fallen away from biblical doctrine or teachings. In many “Christian” circles today, apostasy is more subtle because many have adopted the practice of picking and choosing which verses to believe and which verses not to believe. Self-righteousness is the belief that performing good works and being a good person leads to salvation. Also included in this category would be the reliance on church membership and involvement in various ministries. Note that no transition exists from the Spiritual Man state back to the Natural Man state. This shows that a person cannot lose their salvation. I’ll discuss this topic in greater detail in Parts 2 and 3 of this series. The modes of salvation, choice and election, can be expressed as a cross-functional flow chart where one swim lane represents God’s responsibility for a process or event and another swim lane represents Man’s responsibilities. Figure 2 is the flow chart for Choice and Figure 3 is the flow chart for Election. Note the differences in responsibilities and also the ordering of the events or process steps. The differences between the flowcharts in Figures 2 and 3 may seem subtle on the surface except for the inclusion of the diamond shaped decision symbol in Figure 2 which is absent in Figure 3. The decision symbol represents man’s willful decision to accept the Gospel. In the Election flow chart, the decision symbol is replaced by a process block. In the Election mode, salvation isn’t a decision, it’s a belief or acknowledgement of what has already been given in the Born Again block, which is the main point of contention between Fee Will adherents and Predestination adherents. It should come as no surprise that the dominate position of the Church today is choice, which is a fairly safe assumption to make given that there are literally hundreds if not thousands of sermons, books, and pamphlets supporting that position. Nevertheless, the Scripture teaches one or the other, choice or election, but not both since these concepts cannot both be true at the same time. In my next entry in this series, I’ll discuss some of the more well-known Scripture verses used to support salvation by man’s choice along with a few other beliefs that are commonly taught in that system.